Permanent Mission of Uruguay to the United Nations. Latin America Demilitarization, The Center for International Policy. Trenches on the Web An Internet History of The Great War. Latin American Network Information Center, University of Texas. Discussions of Economic Integration: 9/8/00 (5:00). Latin American Drug War: 2/9/00 (4:00). U.S. Policy in Central & South America: 3/24/00 (3:30). United States Embassy, Montevideo, The Bureau of Consular Affairs. Uruguay: A Small and Proud Nation. Galeano, Eduardo: K-12 TLC Guide. National Soccer Hall of Fame. Economy, Business and Real Estate in Uruguay, Escapeartist.com. Uruguay's Political Leaders, The Z�rate's Political Collections. Arts and Culture in Uruguay, Escape Artist. South American Independence: K-12 TLC Guide. K-12 TLC Guide to Spanish Language. Condombe Music of Uruguay: 8/14/00 (6:30). 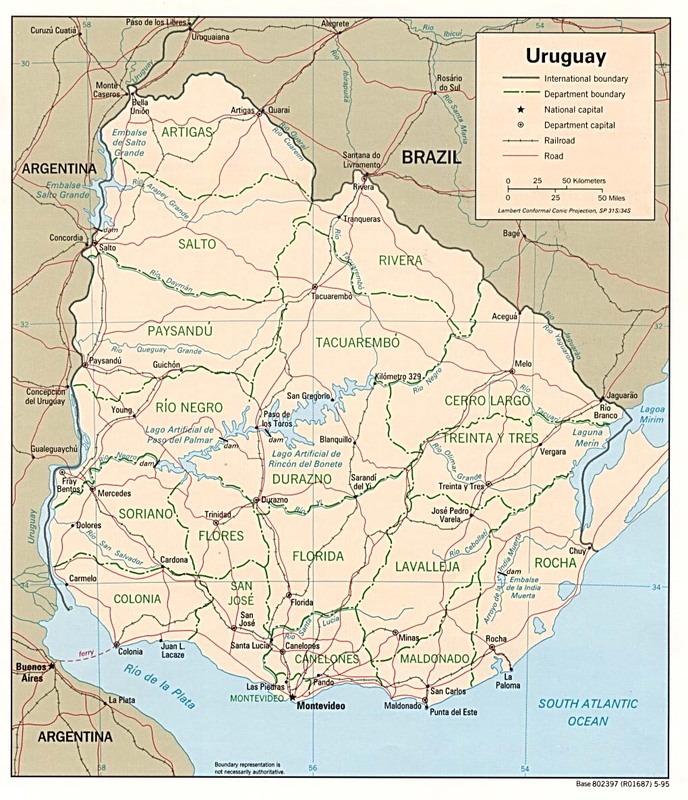 1828 (08/27): Uruguay Proclaimed an Independent State. The WWW Virtual Library, University of Kansas. Political Map, 1995, University of Texas. K-12 TLC Guide to Rain Forests. 09/15: First Day of Hispanic Heritage Month. 10/12/1492: Columbus First Sights Land in the New World. Ancient Aztec, Inca and Maya. Pro Teacher: South America Index.